Why is a dental necessary? Did you know 85% of adult pets have dental disease? If the dental disease is left untreated it can lead to pain and tooth loss for the pet. Chronic infection from dental disease can lead to more serious health concerns resulting in possible damage of the heart, liver, and/or kidneys. Perio Support – This product is designed to support your pet’s periodontal health by helping to control plaque formation and supporting gum health. Teeth Brushing – Daily teeth brushing is recommended. Canine and feline tooth paste should be used and can be found at any pet store. When do I know it’s time for a dental? You should check your pets’ teeth monthly to see what the teeth look like. Is there lots of plaque, any discolorations, bad breath and etc. 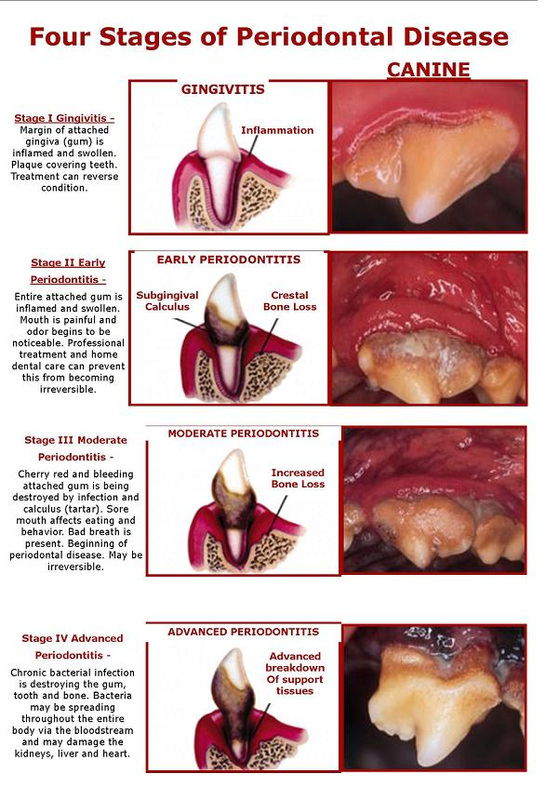 There are 4 stages of canine periodontal disease. Feline dental disease is most commonly noticed when the cat slows or completely stops eating or has bad breath. It is common for cats to get painful lesions on their gum line that can weaken or destroy the teeth. These lesions are typically referred to as tooth resorptions. If your cat seems to be painful when eating and/or has malodorous breath it may be time for a dental. Do you have to use anesthesia to clean my pet’s teeth? General exam before anesthesia to ensure your pet is healthy enough to go under anesthesia. Anesthesia monitoring through out the procedure.